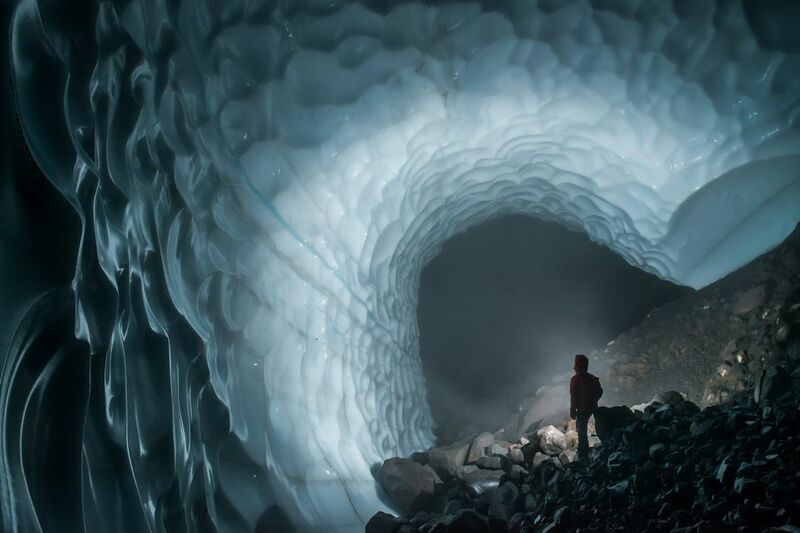 Below the ice cap at Mount Rainier’s summit lies a network of otherworldly grottoes explored this summer by scientists and cavers. 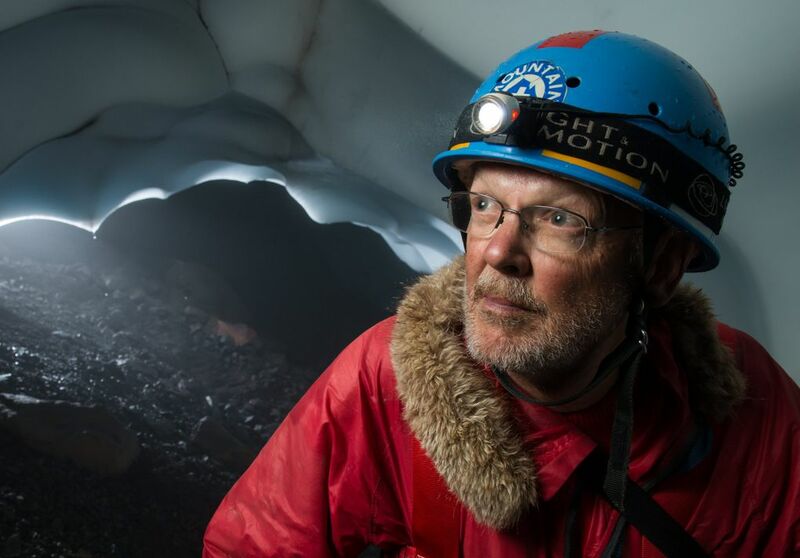 BILL LOKEY PLANTED HIS ICE AX in the crumbly slope and scanned the cavern with his headlamp. Counting all the ups and downs, he had climbed more than 15,000 feet to get here — past yawning crevasses and over cliffs where a single misstep could send a rope team tumbling. His party was pummeled by a lightning storm so ferocious it stood one woman’s hair on end. Gale-force winds threatened to shred their tents. But now, the grin on Lokey’s face said it had been worth it. A ceiling of ice arched 40 feet overhead, glistening as the light danced across its scalloped surface. Steam hissed from fumaroles, misting the air, as it had more than four decades earlier when he first set foot in this otherworldly grotto. “We called this the Coliseum,” Lokey said, nodding in recognition — and awe. In the early 1970s, this was the biggest room he and a group of fellow adventurers encountered as they mapped and explored one of the Pacific Northwest’s least-known natural wonders: the labyrinth of ice caves at the 14,411-foot-high summit of Mount Rainier. The caves form as heat rises from the volcano’s depths and melts the base of the ice cap that fills Rainier’s twin craters. More than 5,000 climbers trudge across those craters every year to tag the highest crest in the Cascade Mountains. Few have any inkling what lies beneath their feet. The ’70s-era map tallied more than a mile of passages in the main crater alone, with countless side channels left untracked. One chamber held a lake, which Lokey named Muriel for his mother. He slithered headfirst down a chute dubbed the Rabbit Hole, emerging to find an icicle as big around as an old-growth fir. “To our knowledge, no comparable system … exists anywhere in the world,” scientists wrote at the time — and no one has proved them wrong. The adventure fired Lokey’s imagination, and he’s been itching ever since to see the caves studied in more detail. This summer, he finally crossed paths with a dream team of experts who shared his passion. Which explains why, at the age of 67, Lokey found himself back in the Coliseum in August. With him was a biologist who studies microbes in environments so extreme they mimic other planets. A geologist joined the group to sample gases that could provide early warning if the volcano begins to stir. A professional photographer was on hand to improve on Lokey’s grainy snapshots. And a team of expert ice cavers came armed with mapping tools that didn’t exist in the 1970s. Their goal was to compile the most complete picture yet of the alien landscape and to tease out clues it might hold to the volcano’s future, and — perhaps — the origins of life in the solar system. All the expedition members were experienced climbers. But that was no guarantee on a mountain that claims an average of four lives a year and foils nearly half of those who attempt to reach its summit. This would be Lokey’s 40th trip to the top of the Northwest’s iconic peak — and he very nearly didn’t make it. The earliest description of Rainier’s summit caves comes from 1870 and the first documented ascent. Gen. Hazard Stevens and Philemon Van Trump crested the crater late in the day on Aug. 17 of that year. A bitter wind nearly swept them off the ridge. With nightfall approaching, the men were delighted to see steam jetting from the rocky rim. The heat had carved an opening under the snow. Lou Whittaker and his twin brother Jim, pioneers of Northwest mountaineering, ventured into the caves in 1954 but turned back out of fear of toxic fumes. Lou returned in 1970 with a firefighter’s breathing apparatus. He wormed through a small opening on the south side of the crater. “We called it threading the needle,” Whittaker recalled. Most people travel light on Rainier’s upper slopes, but members of Lokey’s team carried heavy packs. A lightning storm almost sunk the expedition. For decades, the Whittakers led Mount Rainier National Park visitors on tours of the Paradise ice caves, carved by water flowing under the Paradise glacier. Suffused with blue light, those caves vanished when the glacier melted back. The summit caves were very different — dark and steamy with a hint of brimstone. But the air was breathable, Whittaker found. During 1970s expeditions called Project Crater, Lokey and a cast of young mountaineers and scientists camped on the summit for weeks at a time. They used tape measures and compasses to size up passages, crunching the data on a slide rule. On the cave floors they found dead birds, trash and 19th-century climbing gear, proof that anything left on the summit would eventually work its way down. One cave contains the mangled wreckage of a Piper Cub that crashed on the summit in 1990. After the project, Lokey, who lives in Tacoma, built a career in emergency management. But his fascination with Rainier and its caves never diminished. In 1999, he guided a French volcanologist who paddled around Lake Muriel in an inflatable boat. But few scientists were eager to work in a place with little more than half the oxygen as at sea level and nasty weather year-round. Those in the 2014 expedition team came equipped to deal with almost anything the mountain could throw at them. Lokey’s crew was loaded with winter camping gear, satellite phones and food and fuel for more than a week. The cavers, led by Forest Service law-enforcement agent Eddy Cartaya, lugged rescue equipment, gas monitors to test the air in the caves, and enough medical supplies to stock a field hospital. When Lokey and the others set off on a Monday morning in August, he carried 75 pounds on his back. USGS scientist Matt Bachmann sampled gases from fumaroles, which can indicate whether magma is on the move deep inside the volcano. At 6-foot-2 with a bald pate and gear that dates to the Nixon administration, he cut a conspicuous figure among young hikers sporting the latest parkas. Few of them could match Lokey’s exuberance, though. But by the time the 15-person team rendezvoused at Camp Muir, a cluster of stone huts and outhouses nearly two miles above sea level, Lokey and many others were exhausted by the seven-hour slog. Rainier’s last major eruption was about 1,000 years ago, but the volcano is far from dead. A pool of magma deep underground powers the summit fumaroles, where temperatures reach a scalding 185 degrees. If that magma starts to move, the earliest warning sign could be a shift in gas emissions. A climbing ranger had bad news. A storm was forecast to blow in late Tuesday or Wednesday. Fit and eager, Cartaya and his group decided to leave right away. Their plan was to camp high on the mountain and push for the top Tuesday. Lokey and the others had little choice but to take it slow. They would break the remainder of the climb into two days and hope the storm would hold off until Wednesday. On Tuesday afternoon, soon after those in Lokey’s group pitched their tents at the head of a humpbacked ridge called Disappointment Cleaver, the sky darkened and began spitting pellets of snow. When tent poles and metal stoves started buzzing, Lokey and the other climbers looked around in alarm. Microbiologist Zoe Harrold’s hair stood up on end in the electrically charged atmosphere. With little shelter on the exposed ridge, the group bolted for the lowest ground in sight. They huddled in a small saddle, cringing as lightning flashed through the clouds. Thunder echoed from all directions and the wind blasted them with snow. It was an hour before the lightning abated enough for the team members to take refuge in their tents. The storm raged all night. In the morning, the climbing route was obliterated under more than a foot of fresh snow. One member of the party picked up a forecast on his phone. More thunderstorms were on the way. 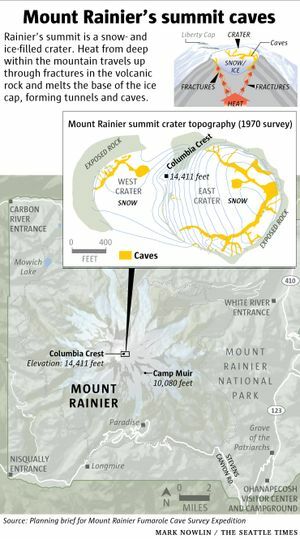 Eddy Cartaya and his team used modern tools, like laser rangefinders, to map some of Rainier’s summit ice caves. The maps will be helpful for search and rescue missions in the caves. Cartaya and his team had just reached the summit Tuesday afternoon when the storm boiled up. Inside, water dripped from the ceiling. The fumaroles’ exhalations warmed the air to 40 degrees, and Cartaya’s gas meter didn’t detect dangerous levels of gases like hydrogen sulfide or carbon dioxide. They made camp much as Stevens and Van Trump had done — but with the advantage of superior gear. Nothing could keep them from getting damp, though, said Cartaya, who got hooked on ice caving when he went to work for the Deschutes National Forest in Central Oregon. After organizing expeditions to glacier caves on Mount Hood, he said the allure of Rainier was impossible to resist. “The opportunity to discover something new is very high — and there aren’t many places left where you can do that,” he said. Updated cave maps can also be useful for search-and-rescue missions and to help monitor changes in the system over time. Cartaya and his team started mapping on Wednesday, marking way points and using laser range finders and inclinometers to measure distances and angles. With cave mapping software, they can convert the data into a three-dimensional image. At the bottom of one vertiginous slope 200 feet down, they discovered a lake that didn’t show up on any previous maps. Cartaya called it Lake Adélie because the azure water reminded him of the blue-eyed Adélie penguin. But he could see right away that this expedition would just be a teaser. The cave network was much larger than the old maps reflected, with tantalizing passageways high overhead that would require ice-climbing gear to explore. He’s already making plans for a bigger expedition in 2015. On Thursday, one of Cartaya’s men woke with a rattle in his lungs. It was pulmonary edema, a life-threatening condition brought on by elevation. The team cut its explorations short and descended that day. Lokey and his group had retreated to Camp Muir to avoid another hair-raising storm high on the mountain. They considered pulling the plug — but the weather was improving. At 2 a.m. Friday, they set out again. Thirteen hours later they crested the rim under sunny skies. Now it was the scientists’ turn to go to work. U.S. Geological Survey (USGS) researcher Matt Bachmann gathered his gear for gas sampling. Rainier’s last major eruption was about 1,000 years ago, but the volcano is far from dead. A pool of magma deep underground powers the summit fumaroles, where temperatures reach a scalding 185 degrees. If that magma starts to move again, the earliest warning sign could be a shift in gas emissions, particularly helium. The USGS regularly samples more accessible volcanoes, but has no helium data from Rainier. Bachman’s specimens, collected in tiny copper tubes, will provide a baseline. Harrold, a University of Washington graduate now at Montana State, sees the caves as a natural laboratory to study microbes that flourish where most life withers. The combination of volcanic heat and gas, frigid water and icy soil is similar to conditions on Earth when the first living things appeared. It’s also what scientists expect on Mars and Jupiter’s moon Europa — two other places in the solar system that might harbor life. Microbiologist Zoe Harrold is studying the microbes in Rainier’s summit caves, where the combination of heat, water and gases is similar to conditions on other planets and on the early Earth when life emerged. Harrold scooped up samples from the lake and the knee-deep mud on its banks. She scraped dirt from around the fumaroles and chipped out bits of ice from the cave walls. And like Cartaya, she made plans to return. 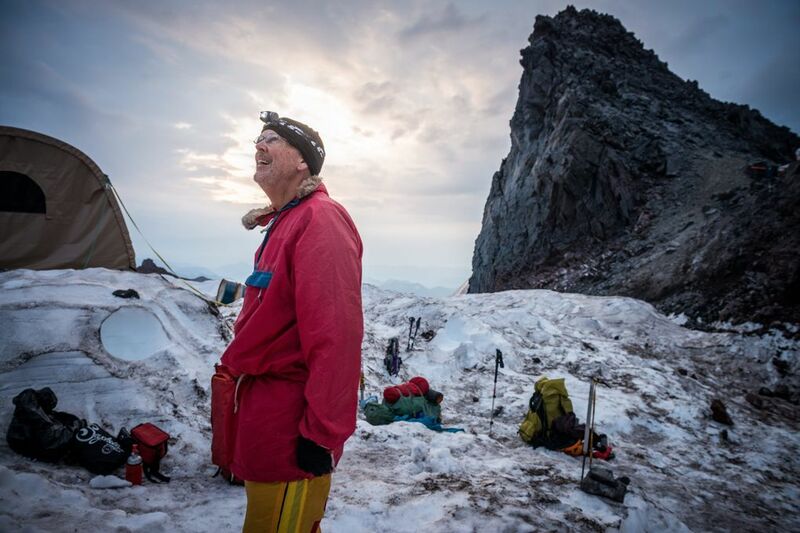 Lokey spent his two days on the summit assisting the researchers and retracing his steps from 40 years ago. “It’s just amazing to be here again,” he said, before heading down Sunday. But as thrilled as he was to see the caves finally get serious attention, Lokey wasn’t sure he would be back. This had been his toughest Rainier climb, and as he loaded up his car in the Paradise parking lot, he shook his head sadly. Two weeks later, when the pain faded, he was immersed in planning for 2015.